The Cape has abundant wildlife and that includes the many feathered friends native to the area. Whether you want to visit a bird sanctuary, such as the Wellfleet Bay Wildlife Sanctuary, the Long Pasture Wildlife Sanctuary in Barnstable, the Barnstable Great Marsh Wildlife Sanctuary, the Skunknett River Wildlife Sanctuary in Barnstable, Sampsons Island Wildlife Sanctuary in Barnstable, Ashumet Holly Wildlife Sanctuary in Falmouth, or even participate in a birding program offered through Mass Audubon, there are many places to go to see the native birds (the many parks and hiking trails are also great spots to see birds and wildlife). Even from your back porch, there are many birds that can be spotted in the backyard. The Cape Cod Bird Club also has walks throughout the year that are open to non-members, so if you want to learn more about the birds in the area with a guide, these are a great opportunity. While the bird most often associated with Cape Cod is the seagull, there are a wide range of birds that can be spotted in the area, from chickadees to blue jays to ducks to owls to herons and many more. 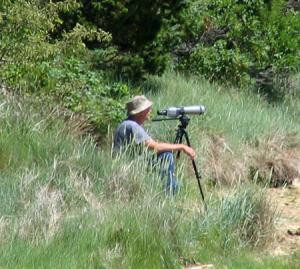 So when packing for your trip, don't forget your binoculars and birding journal. For a full list of birds that can be seen on Cape Cod and the time of year when they are around (from the Mass Audubon Society), click here. Cape Cod is a birdwatcher's paradise--here at Nauset Marsh in Eastham. Photo by Walter Brooks.